Bruce K. Gagnon is Coordinator of the Global Network Against Weapons and Nuclear Power in Space. 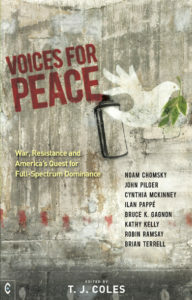 He co-wrote (with this author) Voices for Peace: War, Resistance and America’s Quest for Full-Spectrum Dominance, an edited anthology also featuring original contributions from John Pilger, Noam Chomsky, Cynthia McKinney and other leading activists and researchers. I asked Bruce about the ominous threat of nuclear war or accident with North Korea. T.J. Coles: What’s the likelihood of war? And what would such a war look like? Bruce K. Gagnon: Crazy hot-headed Americans might trigger something or do a false flag to justify a response. South Korea doesn’t want war, but sadly their government is run by Washington. South Korea would be devastated by conventional North Korea artillery and missiles, US soldiers would die by the thousands on their bases inside the country, and NK would be bombed (again, just like in 1950-53) back to the stone age. The war would likely spill over into Japan and could go nuclear quite quickly. It’s madness. TJC: How does America’s North Korea strategy fit into its targeting of China and Pivot to Asia? BKG: NK is the foil – used by the US to justify massive military expansion in the region which is actually aimed at China and Russia. NK is no real military threat to the US – despite their tough talk. But sometimes things don’t go as planned and accidents happen. The NK foil allows the US to now be talking about returning its own nuclear weapons to the Korean peninsula which makes China and Russia very worried. 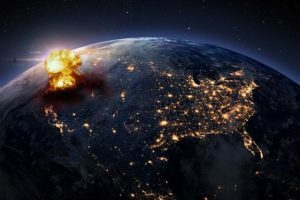 And NATO is now talking about NK being “global problem” that the “Atlantic alliance” must deal with – so they are using this to expand into the global war machine that they’ve been developing since the end of the Cold War. TJC: North Korea has a border with Russia, which, like China and the US, also has nuclear weapons. Where does Russia fit into this scenario? BKG: During the Korean War (North Korea called it the American War) Gen. Douglas MacArthur sent US warplanes over the border into Russia and bombed Vladivostok trying to draw Moscow into the war. They didn’t take the bait. The US has always wanted regime change in Moscow – even now when they’ve gone capitalist. Russia has the world’s largest supply of natural gas and as the Arctic ice melts the fossil fuel companies want to drill-baby-drill in that region – but guess who has the largest land border with the Arctic? TJC: Can you talk about resistance to US missiles and troops in Japan and South Korea? BKG: The resistance to US base expansion and “missile defense” systems (key elements in Pentagon first-strike attack planning) is strong and growing in South Korea and Okinawa. People in those places are fighting to preserve their environment, their culture and the peace because they know they’ve become prime targets in a war. They protest daily – something activists in the US and UK should be doing as our two countries are largely responsible for this out-of-control war machine that we are paying for with cuts in human needs programs and services. TJC: How can we “Westerners” show our support and solidarity with people in the “Eastern” countries? This article was originally published by PIPR. Featured image is from The Sun.